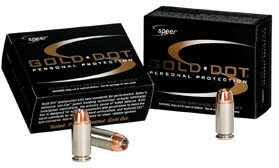 A patented process forms the hollow point cavity in two stages. The core is pre-fluted to define the "fault" lines of expansion, controlling final diameter and retained weight. The second process finishes the cavity and controls the rate of expansion. Select, clean burning propellants deliver optimum velocity while ensuring consistent chamber pressures. Non corrosive CCI primers are used for highly sensitive and reliable performance, as well as nickel plated brass cases for smooth feeding and durability. These technical features allow Speer's engineers to fine tune each specific caliber and bullet weight for maximum field performance.